[177 Pages Report] The Automotive Interior Market is estimated to be USD 235.59 billion in 2017 and is projected to reach USD 301.56 billion by 2022, at a CAGR of 5.06%. The automotive interior industry has seen tremendous changes in the past few years with the advent of advanced technology and innovative designing catered to enhance the comfort, safety, and driving factors. The secondary sources such as company annual reports/presentations, industry association publications, automotive magazine articles, directories, technical handbooks, World Economic Outlook, trade websites, technical articles, and databases have been used to identify and collect information for an extensive study of the global automotive interior market. The primary sources—experts from related industries, automobile OEMs, and suppliers—have been interviewed to obtain and verify critical information, as well as to assess future prospects and market estimations. Players in the global automotive interior industry have been identified through secondary research. Primary research interviews have been conducted with key opinion leaders in the automotive industry, such as CEOs, directors, industry experts, and other executives to validate revenues and market share. The automotive interior market size, in terms of volume (thousand units) and value (USD million), for various regions and product applications has been derived using forecasting techniques based on automobile demand and production trends. The OEM prices of automotive interior components have been verified through primary sources. The base year for the study is 2016, whereas the forecast period ranges from 2017 to 2022. The automotive interior market is majorly driven by increasing number of premium segment vehicles with advanced automotive interior styling. The consumer demand for features such as comfort and convenience are also one of the major factors creating positive demand for automotive interior components. The research methodology used for the study of automotive interior market consists of both primary and secondary research. A bottom-up approach was deployed in order to arrive at market numbers and also for data triangulation. To determine the market size, in terms of volume, vehicle production numbers have been multiplied by country-level penetration of each segment considered in the study. The country-level market size, in terms of volume, is then multiplied with the country-level Average OE Price (AOP) of each system required. This results in the country-level market size, in terms of value. The summation of the country-level market gives the regional market and further summation of the regional market provides the global automotive interior market. Several primary interviews have been conducted with market experts from both the demand (OEM) and supply side (components manufacturers and distributors) players at global level. The key secondary sources referred for this research study include auto industry organizations (such as OICA), corporate filings (such as annual reports, investor presentations, and financial statements), and trade, business, and automotive associations, among others. The automotive interior ecosystem consists of component manufacturers such as Lear Corporation (U.S.), Magna International, Inc. (Canada), Faurecia S.A. (France), Continental AG (Germany), Calsonic Kansei Corporation (Japan), Delphi Automotive PLC (U.K.), Panasonic Corporation (Japan), Hyundai Mobis Co. Ltd. (South Korea), Toyota Boshoku Corporation (Japan), and Tachi-S Co. Ltd. (Japan). These automotive interior components, such as automotive seats, central console, cockpit module, door panels, headliners, and others, are supplied to automotive OEMs. What are the industry trends of the automotive interior market? What would be the impact of government mandates to regularize for safety on automotive interior market? What are the technological developments in the automotive interior market? 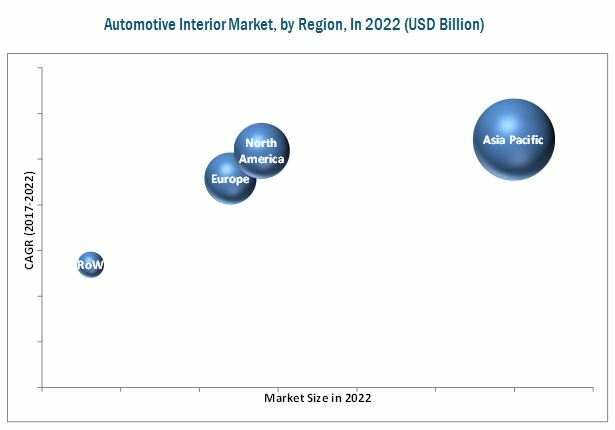 The Automotive Interior Market is projected to grow at a CAGR of 5.06% from USD 235.59 billion in 2017 to USD 301.56 billion by 2022. Increase in demand for premium segment vehicles with advanced styling and rising demand for cabin comfort and convenience led to the growth of this market. The automotive seat segment is estimated to register the largest share in the automotive interior market by component, in terms of value. The average distance traveled by passengers has increased over the years and thus the need for comfort and convenience has increased substantially. Consumers now have higher disposable income and are willing to spend more on the travel and comfort. These factors have positively impacted the growth of the automotive interior market. Infotainment systems are estimated to be the fastest growing market in terms of value. Some of the infotainment systems provide time and temperature display, features such as navigation and more. The type of displays being used for infotainment system may vary depending upon the cost of the vehicle, for example a basic infotainment system can be used in economy cars while advanced display for premium cars. The Passenger Vehicle (PV) segment is estimated to be the largest automotive interior market, by vehicle type, in terms of value. The quality of automotive interior components being perceived by a consumer is much higher in case of PVs in comparison with commercial vehicles. In general, consumers are willing to spend more on vehicles for personal usage than commercial use. The large number of PVs compared to commercial vehicles also adds to the growth of this market. Emergence of industry-wide standards such as the 3D displays, HUDs, smart seating system, OLED interior lights, LED-lighted headliner would trigger growth in the automotive interior market. The growing demand for convenience and safety also presents an opportunity for OEMs to develop new and innovative automotive interior components that would attract customers. The passenger vehicle interior market is the largest market in the global automotive interior market. Passenger vehicles are the most focused segment for automotive interior manufacturers. The technologies used in this type of vehicle are frequently changing due to the high demand from consumers for luxurious features. Also, the government regulations for emission and safety for passenger vehicles are frequently changing. The manufacturers have to reduce the weight of the passenger vehicles and offer comfort and safety to the consumers at a lower price. 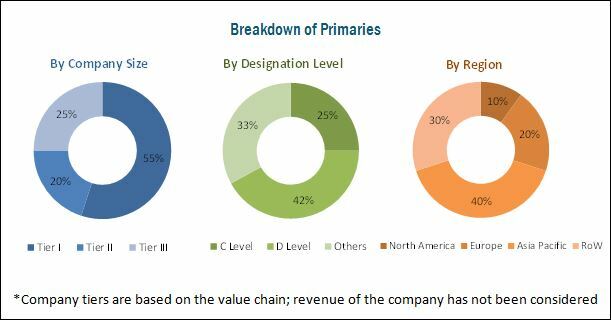 Due to increasing demand for autonomous and electric vehicles, the electronic content is frequently increasing in passenger vehicles interior, which in turn is driving the growth of the passenger vehicle interior market. LCVs are light-good carrier vehicles that are used for commercial purpose. Asia-Pacific is the largest producer of LCVs and accounted for 53% market share of the total LCV production in 2016. The use of LCVs is higher in developing countries than developed countries. These vehicles are very useful for supplying goods to remote places. Also, LCVs helps in small and medium scale industries for the transportation of raw materials and finished goods. North America also showed good growth in LCV production due to the use of these vehicles in small and medium industries and their capability to be used in both, off the road and on the road. OEMs have to balance the comfort and safety features with the overall cost of vehicles, owing to their commercial applications. It is estimated that the LCV market would increase at a steady pace globally, and hence, this would be beneficial for the growth of the global LCV interior market. The HCV segment consists of trucks, buses, and coaches. These types of vehicles are used for carrying heavy goods and public transportation. Drivers of these vehicles spend a lot of time in the vehicle during long-haul for transportation of goods and passengers. Hence, the interiors of these vehicles should be more convenient and comfortable for the passengers and driver. Also, these types of vehicles experience a high degree of wear and tear, depending on the nature of the operation. Therefore, manufacturers of automotive interiors have to use such type of material and technology, which can be durable and efficient. Also, the light weight of the vehicle is very important to reduce carbon emissions. Many regulations, implemented by several governments, are forcing the OEMs to use high-quality material which increases the price pressure on commercial vehicle manufacturers. The cockpit module is a pre-assembly of the driver’s interfaces in the dashboard. Over the years, both, the functionalities and the features offered in the cockpit module have increased. The module design differs according to the vehicle model, and the rising integration of electronics such as HVAC units, navigation, and safety systems among others has increased the complexity of the design. Further electrification of the vehicle will directly influence the design and specification of the cockpit module, compelling suppliers to improve their manufacturing capabilities and engineering expertise. Since the cockpit module houses the interface for many electronic and mechanical interfaces, the HMI factor is one of the important considerations in designing cockpit modules. Increased fuel and performance efficiency requirements in the automotive industry have resulted in a weight reduction of the components and usage of lightweight raw materials. Cockpit module suppliers are focusing on recycling, efficiency, space, and weight optimization, while simultaneously providing design flexibility to OEMs. Headliner refers to the material that is placed on the roof and designed to optimize impact countermeasure and integrate additional lighting. Headliners are designed to blend with the interiors of the vehicle to provide a consistent look in the vehicle. Headliners offer structural stiffness and reduce the noise in the interior. They consist of a tricot knit fabric with melted polyurethane foam that is attached to the fiber glass roof of the vehicle. Sun visors are located above the windshield of the vehicle and protect the driver and front passenger from the direct glare of the sun. The infotainment unit is positioned in the center of the dashboard between the front passenger seat and the driver. It can be a basic infotainment display in economy cars or advanced display in case of premium cars. The central display nowadays is mostly touchscreen, which makes it easy for the driver to operate. The touchscreen is a direct manipulation type gesture, which manipulates the digital world inside the screen without the use of command-line-command. It is a major input and output device which is layered on the electronic display of a processing system. There are different types of touchscreen such as resistive, capacitive, surface acoustic wave, infrared grid, optical imaging, and acoustic pulse recognition. These types of touchscreens will provide unprecedented ease in controlling a car’s function. The latest multimedia interface (MMI) touch helps the driver to input characters, just by using fingers to write on the designated touchscreen. The development of multipoint touchscreen is a major contribution as it allows multiple users to interact with the device simultaneously. The growing use of touchscreen has made it easily available, especially in mobile phones and passenger vehicles, resulting in a decrease in the price of the product. The interior lights include applications such as dashboard light, reading lights, and dome lights among others. The study covers the lighting market for these applications by region. The automotive interior lighting may comprise of Halogen, LED lights, and others. LED lights are fitted for control cabinets, overheads, and vehicle compartments. The reading lights are offered by OEMs as an additional feature along with the dome light. These are soothing lights and help to illuminate the inner side of vehicles. The reading lights are usually LED lights as they consume less power and are brighter. Dome lights are placed in the driver’s compartment. They are used to illuminate the compartment and increase the driver’s convenience. In the past few years, automotive manufacturers have tried to maintain a balance between vehicle handling, ride comfort, and stability. Automotive seats play a vital role in driver and passenger safety and ensure a comfortable ride for both, the driver and the passengers. Advancements in automotive seats have enhanced ride comfort and safety. A vehicle seat usually involves a number of adjustment mechanisms, headrests, and armrests which promote comfort. Highly advanced and adapted technologies such as powered, heated, and massage seats have been introduced in the market. Seat systems contribute significantly to the weight of the vehicle. As weight reduction is becoming a prime area of focus for several seat manufacturers, OEMs and seat suppliers are compelled to develop lightweight seat structures which retain optimum safety. Lightweight seats not only help in reducing vehicular emissions but also result in better fuel efficiency. Automobile manufacturers are developing high-performance and highly efficient seat systems to meet customer’s demands as well as regulations. Automotive seats have substantial commercial potential, as the demand and supply gap for the same has increased. Seat manufacturers have begun developing new technologies that would help them to meet the demands of customers while simultaneously complying with environmental regulations. Which technology will lead automotive interior market? Which companies are leaders in automotive interior market? What will be the impact of increasing demand of safety, comfort & convenience features on automotive interior market?